I'm going to come back to your question because it's difficult to offer helpful suggestions if you can't remember any specific detail of the location - because that's the sort of stuff you really need to be able to come up with really good site-based logging tasks - stuff that's specific to the site and relatively easy for visitors to identify based on the supporting texts on your EarthCache page. I thought this post deserved it's own thread. Team Microdot, you may want to edit your post so it makes sense as an opening post. This is a new feature that they're testing on Norwegian caches initially. A discussion of the feature starts part of the way through this topic. To explain: I recognized the photo, since I took it, and it's on my earthcache page. But it's not because it's an earthcache - it's because the cache is in Norway, which is where they are doing this pilot program on the new feature linked by The A-Team above. 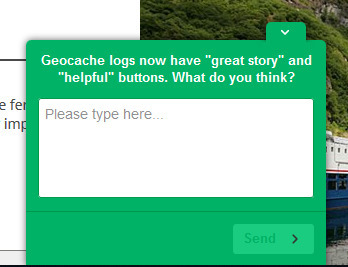 Apparently no one is using it on our earthcache, as all sorts pull up the same order of logs.